Sunder Lal Jain Hospital spread over 3.14 acres in a prime locality at Ashok Vihar, North West Delhi, is scheduled to begin operations under its new brand name Nayati Sunder Lal Jain Super-specialty Hospital, in a phased manner. New Delhi: Nayati Healthcare today announced a collaborative agreement with Sunder Lal Jain Trust to manage and operate Sunder Lal Jain Hospital in Ashok Vihar, New Delhi. Through this agreement, Nayati will extend its superlative clinical and technological expertise with the goal of enhancing the delivery of high-quality health care to people of the region. This is the second expansion by the Group in Delhi NCR, after the takeover of Prima Med Hospital earlier this year. Located in the largest and the most populous North-West district of Delhi, Sunder Lal Jain Hospital is a well-established institution, set up in 1986, which has over the years garnered a tremendous amount of goodwill in its primary catchment area and beyond. Post this agreement, the hospital will offer the latest state-of-the-art tertiary level care in multiple specialities, along with an enhanced capacity from the current 200 beds to 500 beds. The addition of the new hospital will help Nayati consolidate its position in North India by taking world-class healthcare facilities closer to the masses. 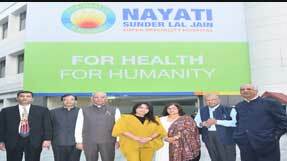 Elaborating on the move, Ms Niira Radia, Chairperson and Promoter of Nayati Healthcare said “Sunder Lal Jain Trust has a legacy of service and cares to its patients for over three decades. We are connected with the common ethos of providing the finest healthcare in the most humane manner to the people we serve. The collaboration with Sunder Lal Charity is a well-calibrated move, given its catchment area and proximity to neighbouring towns of Haryana. When Nayati Healthcare started its journey in 2012, we did a sweeping study from Jammu to Jamshedpur and found that while North India is the most populated part of India, it has one of the most underserved healthcare infrastructures in the country. There is a huge unmet need for quality healthcare in this part of the country. Nayati’s mission is to take super speciality world-class healthcare closer to the people by creating strategic hubs for treatment and facilities across the region, thereby contributing meaningfully to the transformation of the healthcare scenario of the country. All our locations have been chosen carefully considering the gap and the coverage area. The new hospital, coupled with the existing Nayati hospitals in Mathura, Agra and Delhi as well as our upcoming facilities in Gurugram, Varanasi and Amritsar, will provide Nayati with a formidable presence serving a population of more than 300 million. Sunder Lal Jain Hospital spread over 3.14 acres in a prime locality at Ashok Vihar, North West Delhi, is scheduled to begin operations under its new brand name Nayati Sunder Lal Jain Super-specialty Hospital, in a phased manner. Nayati will extend its expertise in terms of operating and running hospitals and the ensuing best practices towards patient welfare and safety. The plan is to initially launch 75 beds in April 2019 followed by additional 75 beds in November 2019, taking the total number of beds under the Nayati brand to a consolidated 1300 beds by the end of next year. Further, it will be developed into a 500-bedded multi super speciality hospital with all key specialities by 2021.